I don’t know how much you know about Vincent Price. If you’re over forty, you probably think of him as somebody who made a lot of horror flicks. If you’re under forty, there’s a good chance you’ve never heard of him. Actually, Vincent Price was a fine actor who worked in film, theatre, radio and TV. Sure, some of the movies he made were lame, but he did a lot of first rate work in films like Laura, Leave Her to Heaven and The Masque of the Red Death. But he was also an art collector, and that’s why he has a museum named after him at East Los Angeles College. Before becoming an actor, Price studied art history at Yale, and in later years he travelled extensively giving lectures on the subject. 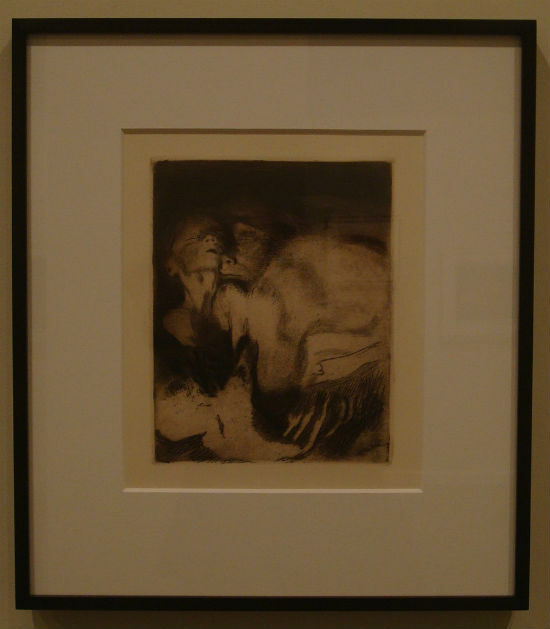 In the fifties he decided it was important for art students to have access to paintings and drawings for their studies, and that was when he and his wife began donating works to ELAC. In 1957 they gave 90 pieces to the college. Now the VPAM collection consists of over 9,000 objects. 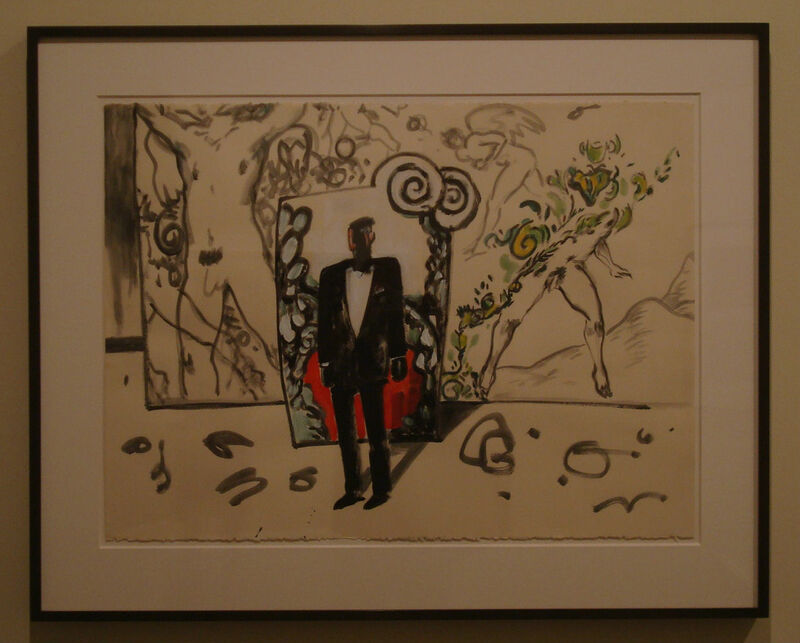 On the day I visited, the museum offered three shows from the permanent collection. The survey of Mexican modernism was excellent. I was also impressed by the twentieth century American and European art on display. (Honestly, I just took a quick stroll through the room full of pre-Colombian stuff. Not my cup of tea.) But the museum also develops its own shows and hosts travelling exhibitions. If you’re interested in checking out their upcoming shows, here’s the link. 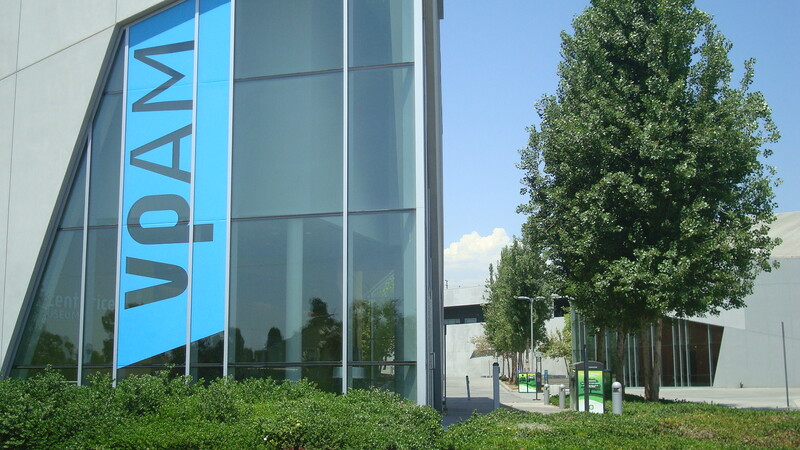 The VPAM is open Tuesday through Saturday, and admission is free. Now that I’ve been there, I’m definitely planning on going back. The new Regional Intermodal Transportation Center at Burbank Airport. I’d heard that the Burbank Airport’s new Regional Intermodal Transportation Center opened some weeks ago, and I’d been meaning to check it out. This morning I went over and took a few photos. It looks nice, but at this point I’m not sure if it’s bringing any huge benefits. I understand that it’s a work in progress, and I hope the completed project lives up to the PR, but right now it seems like what they’ve got is a massive new parking structure that houses a bunch of rental car companies. The MTA web site says…. 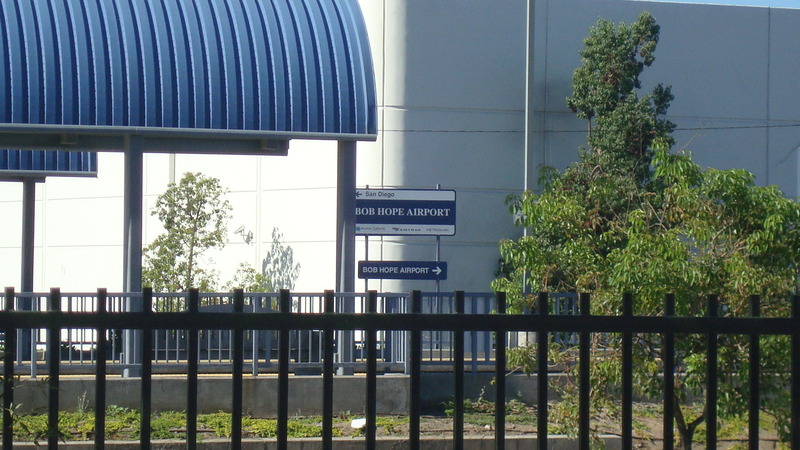 Actually, the airport was built adjacent to the rail line, which has been there since before WWII, and access to the Metrolink/Amtrak stop is no easier than it was before. Even the proposed bridge to the tracks isn’t going to make a huge difference. At some point the RITC is supposed to house a bus terminal, and that could be useful. Bicycle storage facilities are included in the project, but I’m not sure how many people are going to ride a bike to or from the airport. 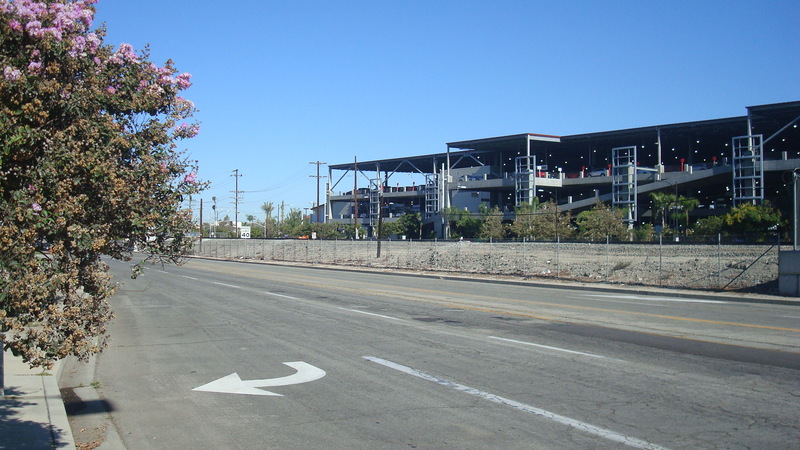 Metrolink/Amtrak stop near Burbank Airport. Below is a link to an article on Curbed. It’s a brief piece that just gives the basic facts about the RITC, but the comments are interesting. Some commenters point out that there would be real benefits in extending the Orange Line to Burbank Airport, and I agree completely. There is a shuttle from the transit center in North Hollywood to the airport, but light rail would be so much easier. I think, though, that plan was proposed years ago, and the MTA couldn’t sell it to the community. If I remember correctly, the Orange Line was originally supposed to be a light rail line that ran from Burbank Airport to Warner Center. As I recall, people in Burbank didn’t like the idea, and residents along the Chandler corridor were up in arms about trains running through their neighborhood. Cost was also a factor. 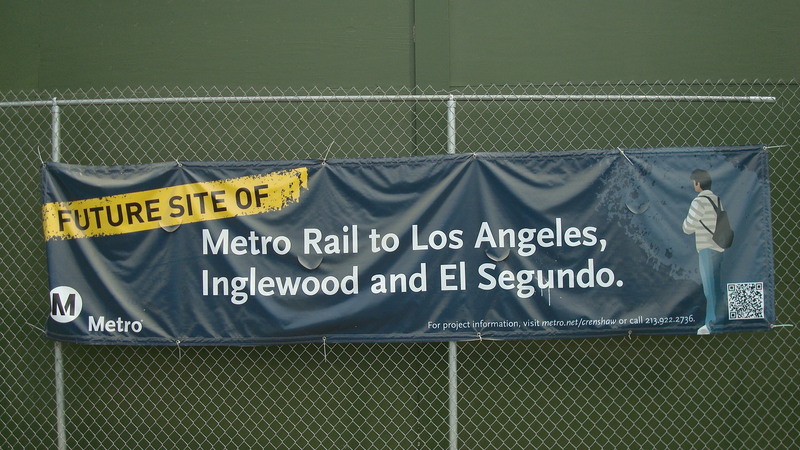 So the MTA settled for what they could get, which was an express bus line from North Hollywood to the West Valley. 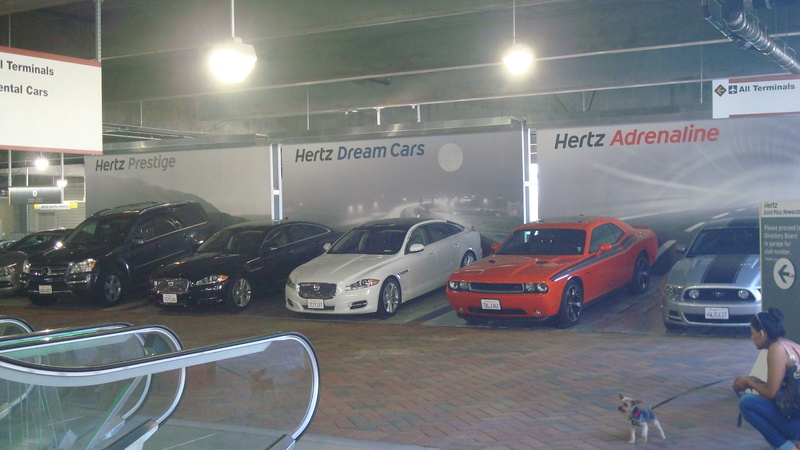 At Hertz, you’re not just renting a car, you’re renting a fantasy. I don’t mean to dismiss the RITC, because in time it could become a useful transit nexus. But at this point it seems to be more about hype than about real benefit to the community. 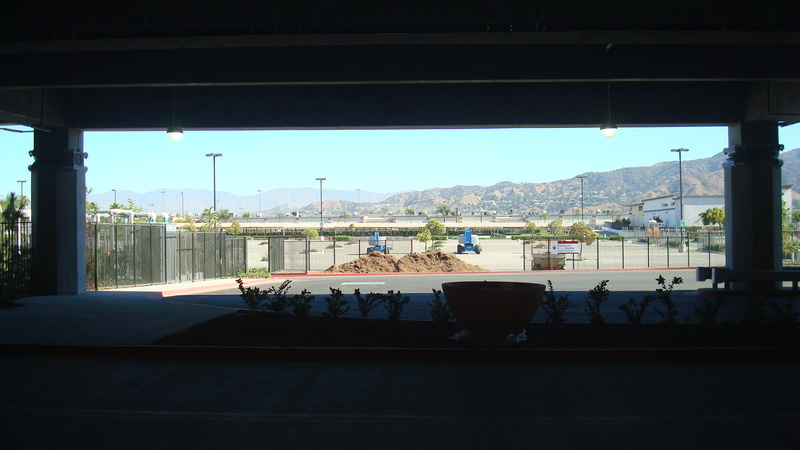 From the RITC, a view of the mountains to the north. 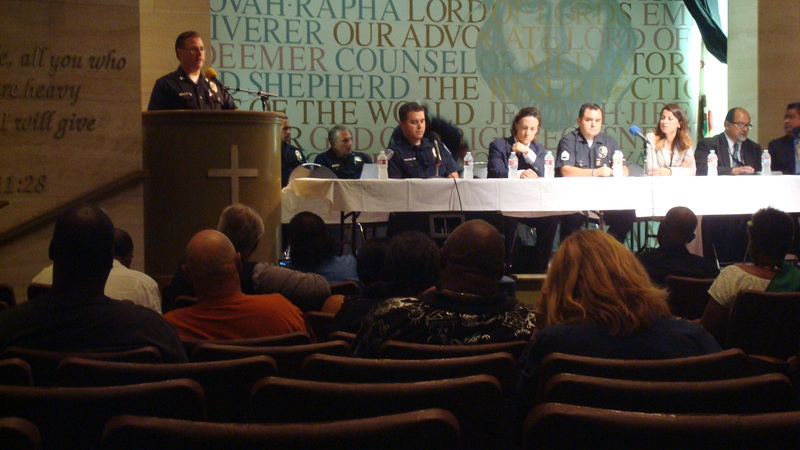 Toward the end of July there was a meeting at the Union Rescue Mission regarding the Safer Cities Initiative. I’d like to stop here for a minute and ask you to think about that phrase. Of course, if you take the words at face value, who wouldn’t support it? We all want safer cities. So if our Mayor and City Council tell us they’re taking action to reduce the crime and the grime in Downtown, how could anyone argue against them. But, as is so often the case, the phrase was created to be blandly reassuring. It’s meant to make people feel good, even if a lot of the people most directly affected don’t feel good about it at all. 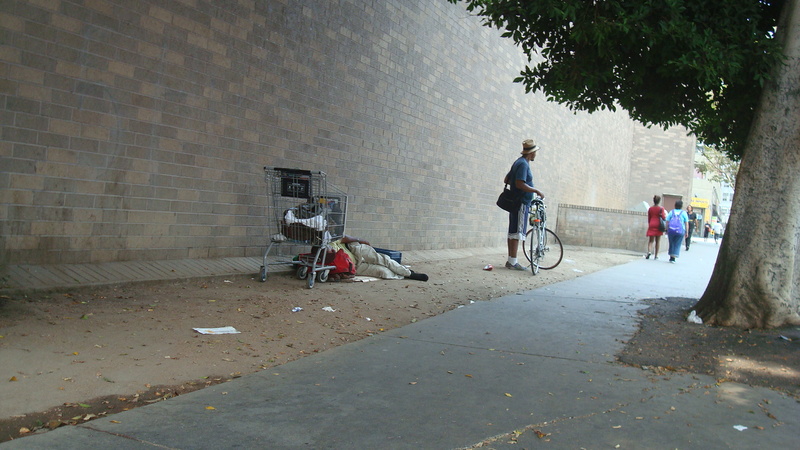 I don’t pretend to be an expert on the homeless problem in Downtown LA. It’s a messy, complicated situation. But what follows is a brief summary of how we got to this point, at least as I understand it…. Back in the seventies it was decided that the best way to deal with the homeless in LA would be to corral them all into one area, away from the financial district and the city government buildings. Local leaders had ambitious plans for the central city, and it doesn’t look good to have a guy who hasn’t bathed for a week sleeping on the street next to your shiny new skyscraper. So with the homeless now out of sight, they were also out of mind, and everybody thought the problem was solved. Then in the eighties LA’s manufacturing base suddenly disappeared, and the illegal drug trade started ramping up. All of a sudden there was a whole new wave of people flooding Skid Row, and instead of docile winos you had guys strung out on crack and PCP. The fact that AIDS and hepatitis were also on the rise made the situation even more dire. But most of us didn’t worry too much about it. A lot of people living in the Valley couldn’t understand why anybody would even consider going to Downtown. The same applied to many west side residents. Successive city government regimes kept pouring money into the financial district, and kept hoping the homeless would just go away. The vast majority of Angelenos paid no attention at all. Then, maybe ten or fifteen years ago, things started to change. Slowly the perception of Downtown started to shift. Younger Angelenos began to see the benefits of living in a place where art and music and bars and restaurants were all within walking distance. And the city government managed to lure a growing number of businesses to the area. Something like a renaissance was taking shape, and gradually Downtown became the cool place to be. That was the upside. Unfortunately, in the middle of this renaissance, there were still all these homeless people hanging around. 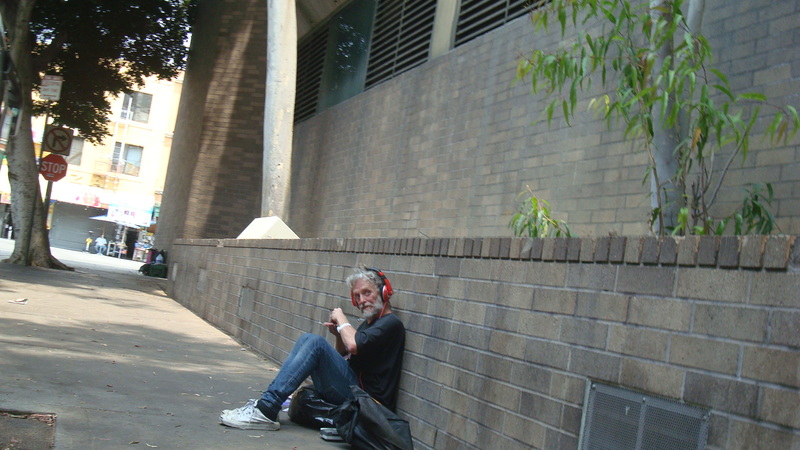 The business owners and some of the newer Downtown residents were freaking out, sometimes with good reason, over the problems created by having a huge number of people, some drug users, some mentally ill, living on the streets. And this is where the Safer Cities Initiative comes in. Back in 2007, Mayor Villaraigosa and Chief Bratton decided to adopt a zero tolerance approach to crime in Skid Row. Even small offenses resulted in an arrest, with the possibility of time in jail. On top of that, the LAPD was charged with conducting regular sweeps of the area to clear away anything that was blocking the sidewalks, i.e. shopping carts, tents, boxes, etc.. Among other problems with this approach, they ended up trashing property belonging to homeless individuals, including personal documents and prescription medication. A suit was filed to stop the sweeps, and a judge agreed with the plaintiff, putting an end to the practice. For a while. This put the city back at square one. How to deal with the impacts caused by thousands of people who have nowhere to go except the streets of Skid Row? At this point, the LA County Department of Health stepped in. They conducted an investigation and produced a harrowing report that documented the many health problems in the area, like rats, used hypodermic needles and human waste. This gave the city the justification they needed to start in with the sweeps again. Which brings us up to the present, and back to the meeting at the Union Rescue Mission…. While they’re still calling it the Safer Cities Initiative, officials have tweaked the program in the hope of making it more effective. Now the LAPD will issue citations for minor violations instead of arresting people. The sweeps will resume, as part of the Operation Healthy Streets program, but now case workers and mental health professionals will accompany the cleaning crews. The word is that the homeless will be offered free medical exams and TB tests, and an effort will be made to get people into detox or enroll in a health care program under the Affordable Care Act. This sounds good on paper. 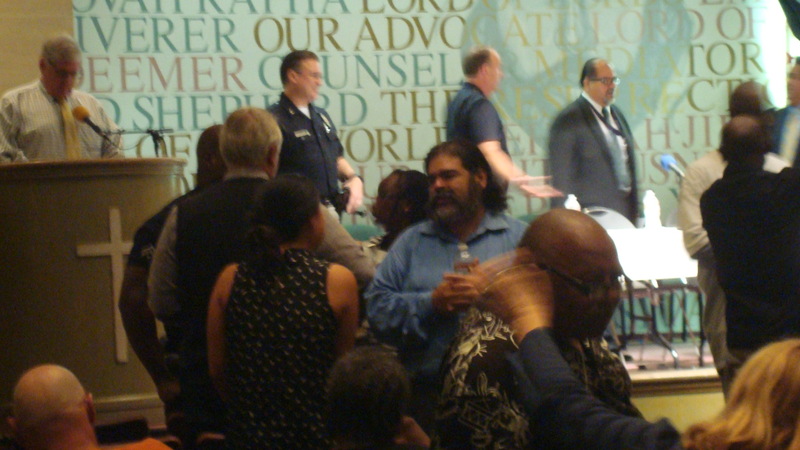 The city officials who were on the panel at the meeting tried to keep it positive, though a woman from Jose Huizar’s office downplayed the modifications to the street cleaning program. She emphasized the fact that this was something the City was trying out, and that it wasn’t intended to be a solution to the homeless problem. It’s not a solution. While this approach is better than what the City was doing before, it’s basically a band-aid, and the situation on Skid Row is not getting better. It’s getting worse. In recent years the State of California has been forced to release thousands of inmates from its prisons. It’s a real challenge for someone with a criminal record to find steady work, which also makes it hard to find a permanent place to stay. So a lot of those people who were pushed out of the prisons ended up on Skid Row. The non-profits who serve the homeless, like Union Rescue Mission, have been struggling for years. Now they’re completely overwhelmed. The City needs to make a serious effort to provide permanent supportive housing for the homeless. Yes, this would cost money, and we’re still operating on a tight budget, but we could get the ball rolling. In New York, Mayor de Blasio has made a commitment to create permanent supportive housing, and we could do the same here. As expensive as this approach is, it’s still way cheaper than throwing people in jail for minor violations. We are currently spending a fortune on prison beds for non-violent offenders who would be better served by relatively inexpensive programs providing rehab and mental health care. And building permanent supportive housing would make Downtown a cleaner, safer place, creating an environment where business could thrive. Phrases like Safer Cities Initiative and Operation Healthy Streets sound nice, but handing out tickets and clearing the streets every other month will not solve the problem. We need to stop being reactive and start being proactive. If you feel, like I do, that we could be doing more, then give your City Council rep a call and let them know. This is pretty last minute, but I just found out about a historic building in West Hollywood that could be demolished as part of a proposed development. I hadn’t heard anything about it until I opened up my e-mail this afternoon. A friend forwarded a message to let me know that this structure, designed by Wurdeman & Becket back in the thirties, might be wiped off the map unless we take immediate action. 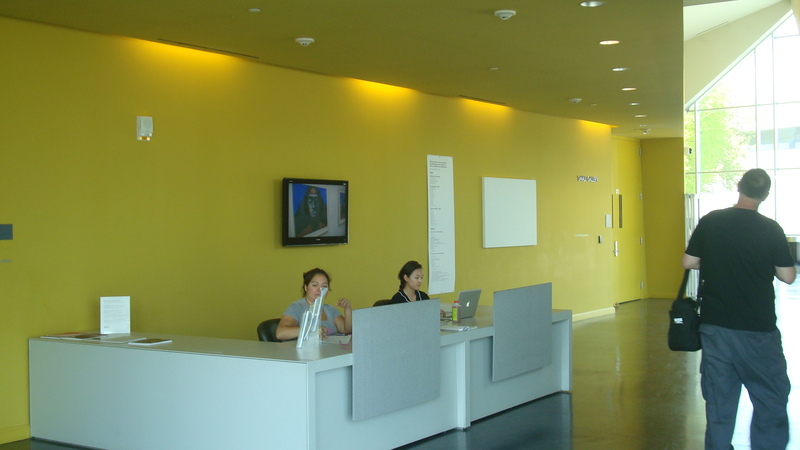 The building, located at 9080 Santa Monica Blvd. 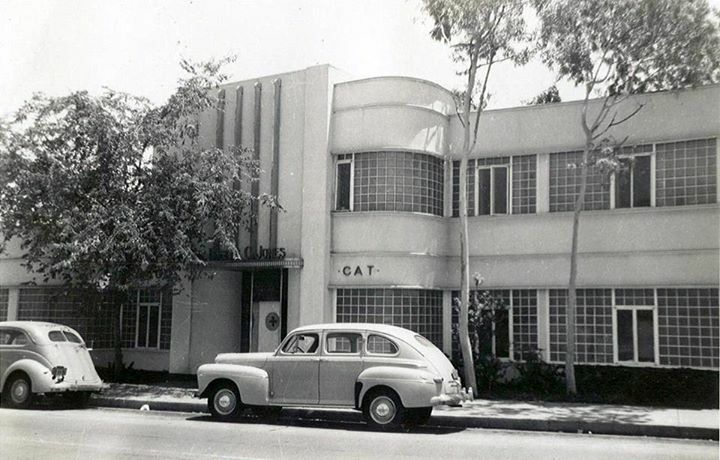 in West Hollywood, was originally the Jones Dog and Cat Hospital. Architects Walter Wurdeman and Welton Becket created a classic example of the streamline moderne style to house the veterinarian’s practice. As a firm, Wurdeman and Becket were active in the thirties and forties, their most famous creation being the Pan-Pacific Auditorium, which burned to the ground many years ago. After Wurdeman’s death, Becket’s new firm, Welton Becket & Associates went on to design some of the city’s most striking structures and played a huge role in defining the look of mid-century Los Angeles. For more info about the building, click on this link. And then if you decide you want to tell the West Hollywood City Council how you feel about this, here’s another link. See the left hand column for contact info. LA has made great strides in preservation over the last several years, but we’re still losing important parts of our past. The recent demolition of a building by Morgan, Walls & Clements on La Brea was a shock, and should be reminder to those of us who care about our city’s culture that we need to be vigilant and vocal. 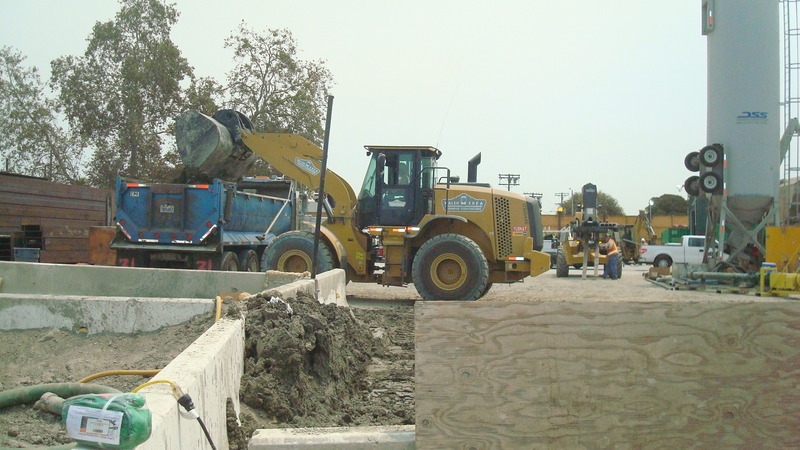 Last week I went down to Crenshaw and Exposition to see what was happening with the construction of the Crenshaw/LAX Line. 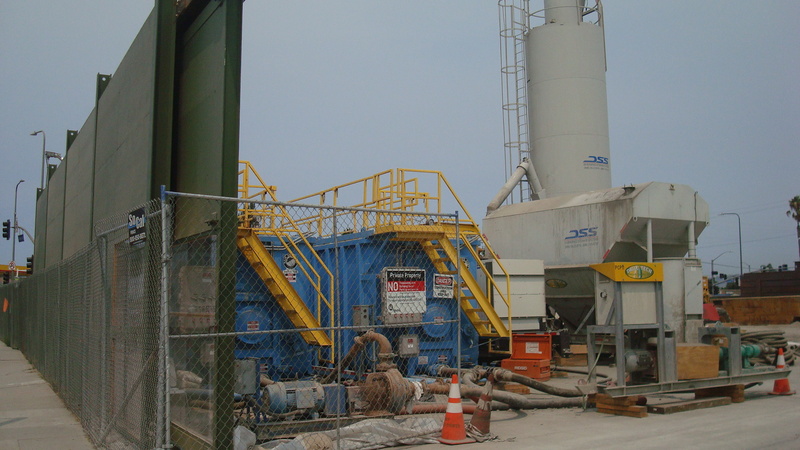 Work is underway, though it will be years before the project is finished. 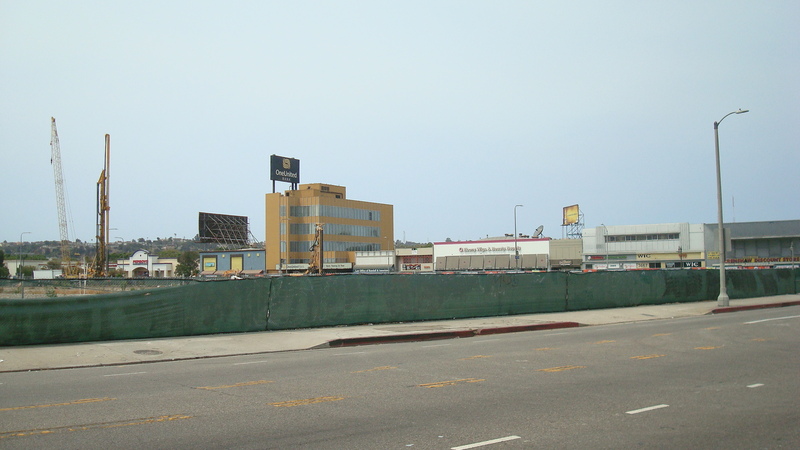 A view from the Crenshaw side of the construction site. 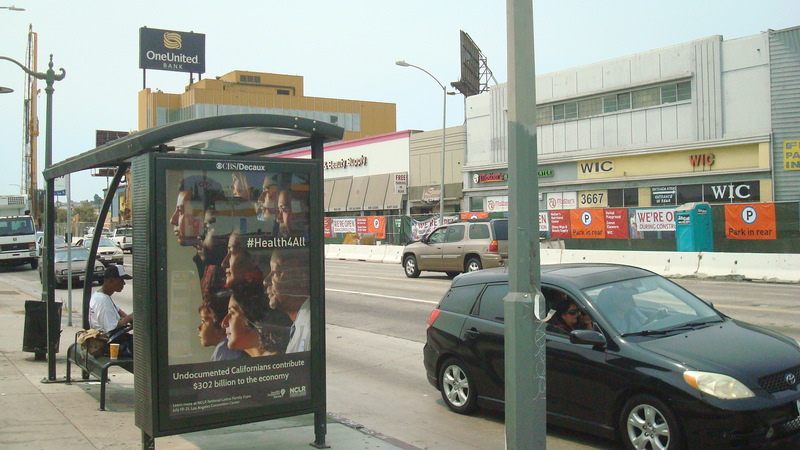 Another view from the Crenshaw side. And here’s a shot taken from the entrance to the site. While I was there I also took a look at the huge vacant lot that runs along Crenshaw just below the MTA’s construction site. 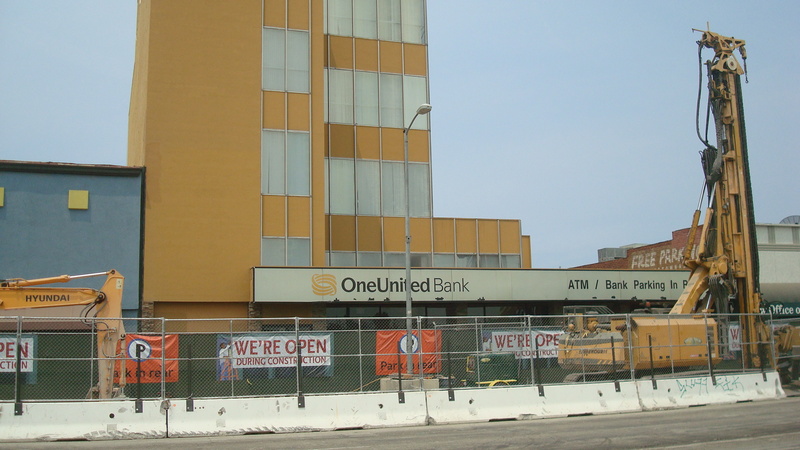 The fence surrounds a large empty parcel just across the street from the MTA site. I was wondering if there were any plans to develop the parcel, so I got on the net and started looking around. Apparently this will be the home of the proposed District Square retail complex. For more info, follow this link to a post from earlier this year on Building Los Angeles. Right now it’s just a lot of dirt, but the temporary fence running around this area does offer the candidates in the school board special election a place to post their ads. School board candidates vying for your vote. You can see the barricades blocking off a good stretch of Crenshaw. 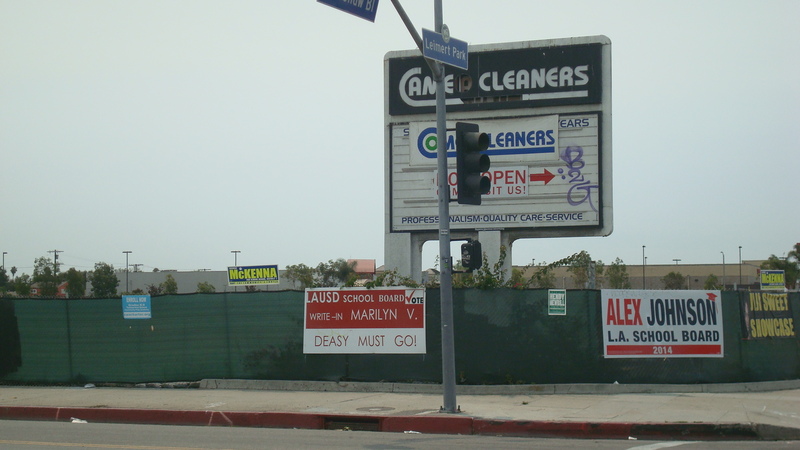 Also the large signs letting people know that the businesses along Crenshaw are open during construction. 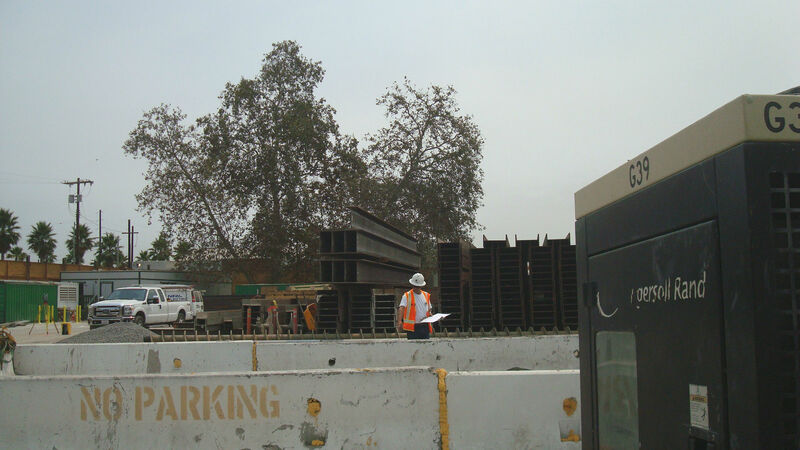 Looking at the barricades set up on the west side of Crenshaw during construction. Projects like this can be really hard on business owners, since the work impacts both traffic and parking. And we’re not just talking about a few months, but years. In the long run, the transit line will probably bring more people to the area and be a boon to local merchants, but in the short term, the construction can cause real hardship. Heavy machinery parked on Crenshaw. If you haven’t already read about the Crenshaw/LAX Line, here’s a link to the overview at the MTA’s web site.